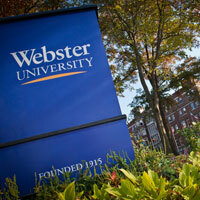 Webster University has appointed Douglas (Doug) Rau as its interim Chief Human Resources Officer, effective Jan. 15. Rau brings human resources experience from several industries including life sciences, consumer products and manufacturing. His areas of expertise include talent strategy, recruiting, M&A due diligence and integration, project management, risk management, talent management, succession planning and capabilities development. “Considering Webster University’s reputation for excellence and global reach, I am very excited to work with President Stroble, Provost Julian Schuster and the leadership team to continue attracting, developing and engaging high-quality talent,” Rau said. Most recently, Rau spent a decade as part of the leadership team of Sigma-Aldrich Corporation, serving as corporate vice president of human resources for the $3 billion global life sciences manufacturer with 10,000 employees in 16 countries. Prior to Sigma-Aldrich, which was acquired by Merck in 2015, he held HR leadership positions with Kellwood Company and Pet Incorporated. Since 2016 he has practiced human resources leadership as a consultant to a variety of international and regional clients. Rau holds a bachelor’s degree from the Trulaske School of Business at University of Missouri-Columbia, and an MBA from St. Louis University.